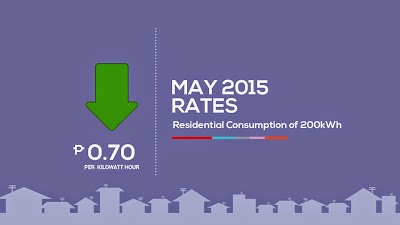 The Manila Electric Company (Meralco) said that overall rates went down by PhP 0.70 per kilowatthour (kWh) this May. Said decrease is due to lower generation costs from all power suppliers of Meralco. Meralco reiterated that it does not earn from the pass-through charges, such as the generation and transmission charges. Payment for the generation charge goes to the power suppliers, while payment for the transmission charge goes to the National Grid Corporation of the Philippines (NGCP). Of the total bill, only the distribution, supply, and metering charges accrue to Meralco. Meralco’s distribution charge has not registered any adjustment and has remained at the same level for 10 months now or since July 2014.